Stath hooks up with Carole and everyone is talking about it. It's Sophie results day and she fails her courses. Stath and Sophie meet Tomoko, Al's girlfriend. Marcella is an aspiring actress recovering from a relationship break up. Despite her optimistic attempts, and with help from her friends, therapist and driving instructor, she is unable to get her life back on track. 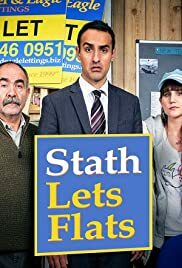 I really liked the debut of this series, its very British but with a Greek twist which is what makes its points of humour completely unique and unexpected.